Buffalo Chicken Spicy Deviled Eggs, all flavors of buffalo chicken wings, moist chicken, hot sauce, crunchy celery, and creamy blue cheese.. topped on boiled eggs. Just 5 ingredients, so much flavor on top of hard boiled eggs, these deviled eggs are the best deviled egg recipe ever! Whenever we plan movie-night-at-home or friends coming over.. some easy and delicious snack options are must haves. 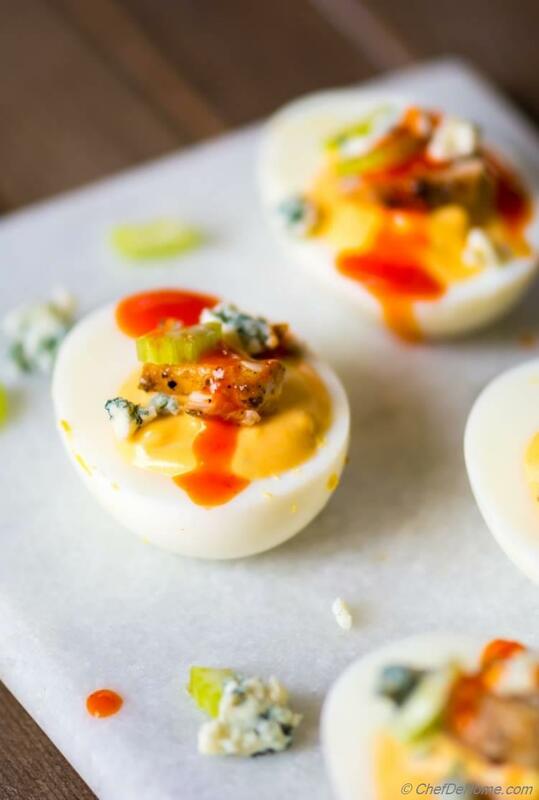 Since you can never go wrong with deviled eggs, I love to boil a couple of eggs and top these with different toppings to have something for everyone! Such as these spicy deviled eggs for grown-ups and some traditional, or less spicy version of these deviled eggs, for kids. Deviled eggs are very easy to put together. 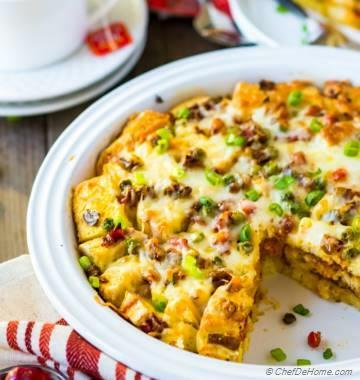 Once eggs are boiled and peeled, there are endless combination of flavors to top on these. Just 15 minutes prep and 12 minutes cooking... this delicious snack fly from kitchen to snack table! If you are new to Deviled Eggs, deviled eggs are hard boiled eggs, sliced in half and topped with various kind of scrumptious toppings. For traditional deviled eggs, yolks are removed from eggs. These are then blended with mayo, mustard, seasonings, and pickles for combination of tangy and creamy flavors. 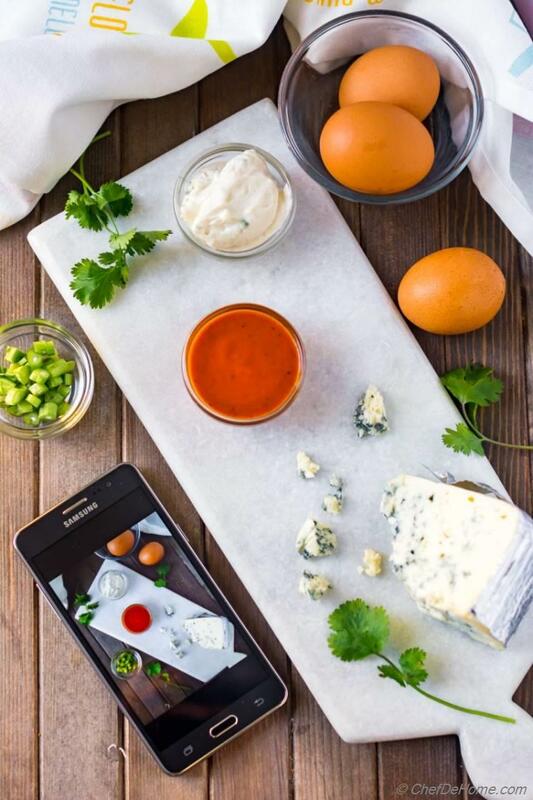 Then creamy mustard-y mixture is piped back onto egg whites and topped with garnish of herbs. Deviled eggs are often served as appetizer or snack. One of the best deviled eggs I have every eaten in a party was spicy deviled eggs made with sriracha hot sauce. Today, my spicy buffalo chicken spicy deviled eggs are inspired from that spicy recipe..
..before I dig deeper into this recipe, I must say! I hope you had fun welcoming spring! In my part of the world, Californians like to jump straight from winter to summer! :) You know, what is the temperature from past two days?! In mid-80s!! We stepped out for few hours on Saturday... and it felt like a hot summer day.. nothing like spring! Good parts is, I only had planned testing/shooting of few recipes.. and organizing my blog's spending's for next tax year. We try to take "stress" out of tax-time by planning in advance, making sure to log everything we spend on blog.. so that we can relax and make most of tax refund money. 2. To maximize on flavor of buffalo chicken, I mix a portion of hot sauce with egg yolks, and mayo mixture. 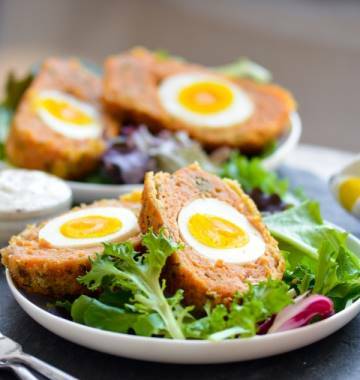 This seasons the base creamy filling and adds lot of flavor in each bite of deviled eggs. 3. For some crunch, I added chopped bits of celery in filling and on top. I would skip celery in filling If I was piping this mixture. 4. Instead of blue cheese dressing, I only topped it with crumbled blue cheese. This works out well because drizzle of hot sauce compliments the tang of blue cheese better than creamy cheese dressing. PS: Even though recipe calls for mayo, these deviled eggs are mayo-free because I have used egg-free mayo substitute for this recipe. You can use regular mayo too. I kept these mayo free because I can't eat raw-protein found in mayo. 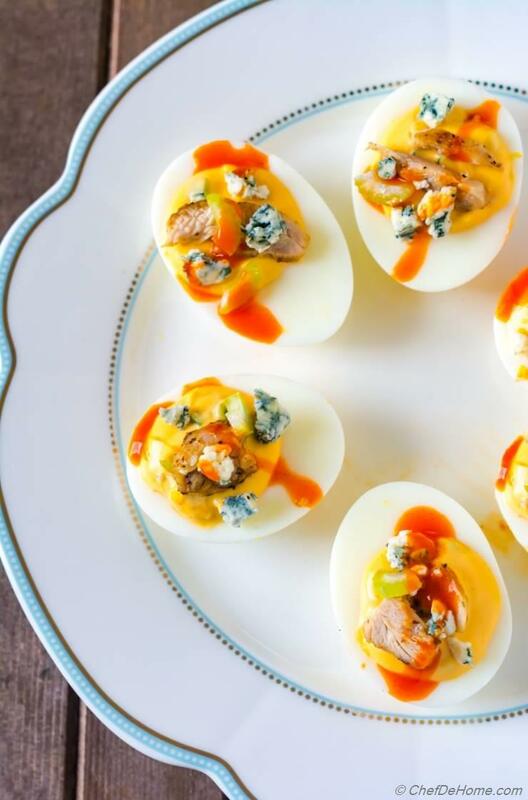 Friends, don't you think, buffalo chicken deviled eggs look like bright sunshine days of spring-summer?! 1. Boil eggs with cold water until start boiling. Once started boiling, remove from heat and set aside in hot water for 12 minutes. 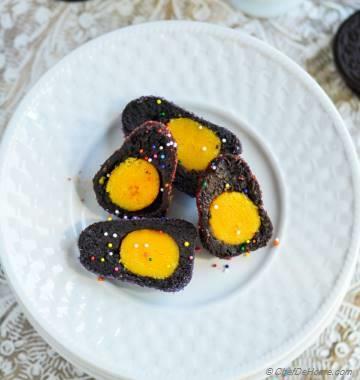 Once eggs have cooled. Peel eggs and slice in half. 2. In food processor jar, add egg yolks, mayo, salt and hot sauce, process to get lump free filling. Taste and adjust salt and hot sauce. (sauce will have pleasant orange color and flavor of hot sauce.) Remove in a bowl and mix in half of the celery. Spoon into egg halves. 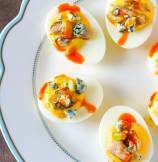 Place filled eggs on deviled egg platter. If planning to pipe the filling, don't add celery in the filling, instead just garnish on top. 3. Top with small piece of chicken, more chopped celery, and dots of blue cheese. 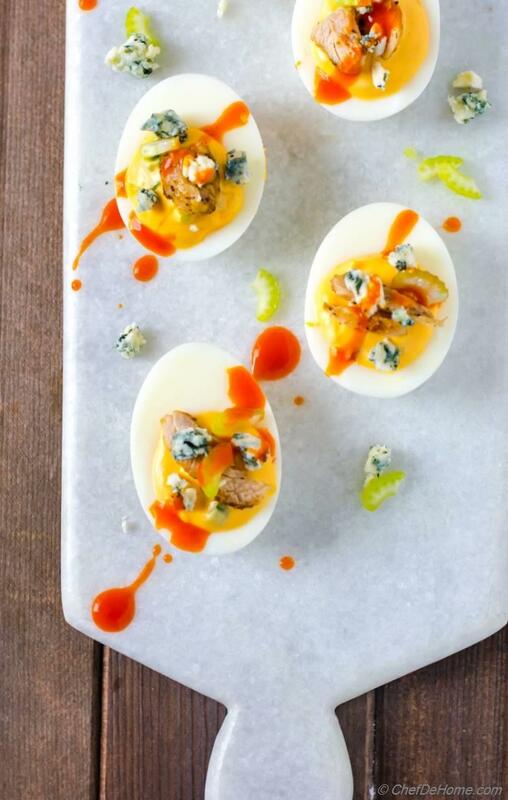 Drizzle or spoon over remaining hot sauce over finished deviled eggs. Serve and enjoy! Alan, we are sorry to hear you were not able to print. Can you share the browser you'er using to open the wep page? thanks.